View three toed sloth photos, license three toed sloth stock pictures, and buy stunning three toed sloth prints by award winning professional photographer Jon Cornforth. To license an image for editorial or commercial use, click on the License Image button and fill out the form. To purchase a fine art print, select your image size and presentation style before clicking on the Buy Print button. Three-toed sloths are tree-living mammals from South and Central America. The four living species of these are: the brown-throated sloth, the maned sloth, the pale-throated sloth, and the pygmy three-toed sloth. These animals are about the size of a small dog or a large cat, with the head and body having a combined length around 45 cm (18 in) and a weight of 3.5–4.5 kg (8–10 lb). Unlike the two-toed sloths, they also have short tails of 6–7 cm (2–3 in), and they have three clawed toes on each limb. They are frequently referred to as three-toed sloths, but all sloths have three toes. Rather, the difference lies in the number of fingers, meaning that they are more appropriately referred to as three-fingered sloths. Unlike the two-toed sloth, three-toed variety are agile swimmers. However, they are still slow in trees. In terms of child rearing, the offspring cling to their mother’s bellies for around nine months. Because they cannot walk on all four limbs, they must use their front arms and claws to drag themselves across the rainforest floor. These sloths are arboreal (tree-dwelling), with a body adapted to hang by their limbs. They live high in the canopy, but descend once a week to defecate on the forest floor. Their long, coarse fur often appears greenish, not due to pigment, but to algae growing on it. 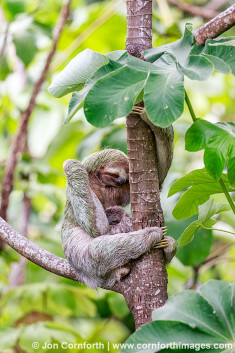 Sloths’ greenish color and their sluggish habits provide an effective camouflage; hanging quietly, sloths resemble a bundle of leaves. Large, curved claws help them to keep a strong grip on tree branches.